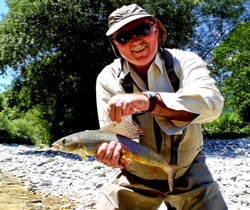 SLOVENIA’S Soca River is renowned for its exceptional flyfishing for trout and grayling. Indeed, it has played no small role in my family and in my own angling development. I grew up being enthralled by my father’s fishing tales based on his experiences on the Soca River, in particular the story of a 20kg marble trout speared by a road worker, with a garden fork in a pool below a small hydro-electric plant. As I grew older, and more sceptical, I suspected that this was probably a case where the truth was not allowed to spoil a good story. Then a cousin who lives in the area forwarded me a newspaper cutting. 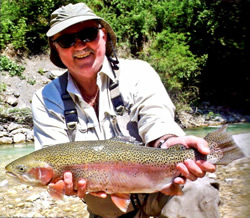 A 22.5kg marble trout had been caught near Tolmin by an Italian flyfisher. This convinced me that it was time to explore my roots and fish the area. Before the Second World War, Italy’s territory extended into what is now Slovenia, and the 140km long Soca River, known as the Isonzo in Italy, was closely tied to my family’s lives during the 1920s and 1930s. My grandfather worked for the government’s water authority, and he and his family lived alternatively in the small towns of Bovec and Tolmin where four of his children, including my father, were born. Nowadays these towns are the springboard for the large adventure sport industry as well as for the amazing flyfishing. 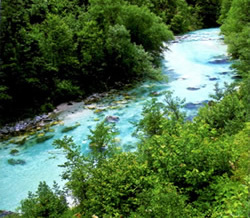 Besides the Soca, this area also hosts the smaller but equally rewarding Beca, Idrijca and Tolminka rivers. All have description-defying clear turquoise-blue water, white gravel and limestone boulders. The Soca is often described as the most beautiful river in Europe, and it not only teems with rainbow trout and the Adriatic sub species of grayling (Thymallus thymallus), but is also home to the rare marble trout (Salmo trutta marmoratus). 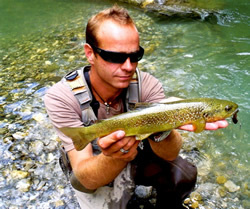 The marble trout is not, as is often thought, a sub species of the brown trout, but a separate species with habits very different from its cousins. It ambushes its prey by shooting out like a torpedo from its hiding place under boulders. It is also mainly piscivorous. A 40cm grayling that I caught had fresh bite marks around its tail peduncle, bearing testimony to the aggression and size that these fish display. As recently as the 1960s this wonderful fish was facing extinction, but then the authorities and the flyfishing community decided it needed protection and the results are a success story that warrants greater recognition.